Free White Paper: Security in "the Cloud"
Are you worried about the security implications of moving to the cloud? 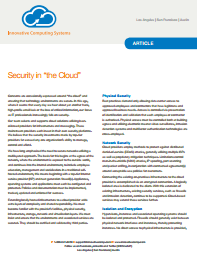 In this white paper, Innovative Computing Systems CEO Michael Kemps discusses key aspects of a secure cloud computing infrastructure. We have long emphasized the need to secure networks utilizing a multilayered approach. The basis for this begins at the egress of the network, where the environment is exposed to the outside world, and continues into the internal environment, to include employee education, management and socialization. In a traditional selfhosted environment, this means beginning with a top-tier Internet service provider (ISP) and next generation firewall(s). Appliances, operating systems and applications must each be configured and protected. Policies and documentation must be implemented, tracked, updated and enforced for success. Download this free white paper by filling out the form.